Lobsang Sangay, the Tibetan prime minister in exile, gives off the impression that there is more that unites his people and the Chinese authorities who have ruled them for over half a century, than divides them. China might call him a separatist, and members of his own community might set themselves on fire protesting Chinese rule of their homeland, but the Harvard Law School graduate says that the demands of Tibet’s leaders are in line with the rights of minorities as set out within China’s own constitution. “We are asking China to implement its own laws, and that could amount to autonomy for us,” Mr. Sangay, who in 2011 was elected head of the exiled Tibetan government in the northern Indian state of Himachal Pradesh, told The Wall Street Journal. Tibetans living on the Tibetan plateau fulfil that requirement, argues Mr. Sangay, ergo China must change its constitution, or accept the demand for full autonomy. The Dalai Lama, the Tibetan spiritual leader, describes this as a “Middle Way” approach. The deadlock and distrust between Tibet and China has existed for over half a century, since China incorporated Tibet into its territory in 1950, claiming that the land was always an inalienable part of China. Things worsened in 1959 when 80,000 Tibetans, including the Dalai Lama fled into exile in India following a failed uprising. China created the Tibet Autonomous Region, located on the Tibetan plateau, between China and India in 1965, as part of an agreement between Tibetan representatives and Beijing. “But it’s not autonomous, honestly… only in name and on paper,” Mr. Sangay said sipping tea at the New Delhi representative office of the Dalai Lama. In support of his contention, Mr. Sangay presents the evidence. Schools and universities in the region teach in Chinese, Mr. Sangay says, contrary to the Chinese constitution, which gives minorities nationalities the right to use their own languages. 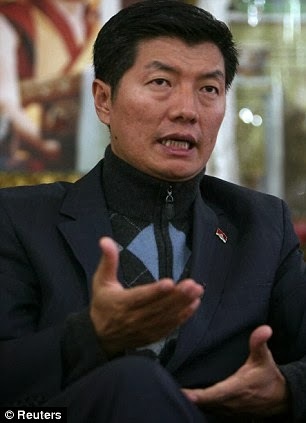 Leading political figures in the Tibet Autonomous Region politburo are Han Chinese, the dominant or majority ethnic group of China or have a Chinese spouse, Mr. Sangay claimed. Although the region’s governor is Tibetan, the office is subordinate to the branch secretary of the Communist Party of China, who is always Chinese, the exiled prime minister added. According to him, the majority of private businesses in the Tibetan Autonomous Region are owned or run by Chinese people, and unemployment among Tibetan school and college graduates there is running at 40%. Wages on offer in some businesses in Lhasa, the capital are openly greater for Han Chinese employees than non-Chinese workers, Mr. Sangay added. The size of the territory that makes up the Tibet Autonomous Region is also a point of dispute. Some parts of the Tibetan plateau have, since the 1950s, been incorporated into neighbouring Chinese provinces of Sichuan, Gansu and Yunnan. Mr. Sangay’s solution to this would, he says, benefit the Chinese authorities as well as the Tibetans living there. “From the administrative point of view, it’s far more efficient and effective to have one policy and one implementing mechanism for all the Tibetan people because they are of the same culture, language, economy and custom,” he said. Beijing says clubbing of Tibetan areas into one unit is unreasonable because that would amount to a quarter of China. Sichuan province has 80 million Chinese and about two million Tibetans living there, Mr. Sangay said. “Now if you’re governor of Sichuan, you will dedicate about 3 to 4% of your time and energy to Tibetans,” said Mr. Sangay. Mass migration of Han Chinese to Tibetan areas is another sticking point between Beijing and Tibetans. China claims Han Chinese people can help develop the Tibet Autonomous Region, which has the lowest population density among province-level administrative regions. But Tibetans see the migration as an attempt to make the region more Chinese. A key purpose for the Tibetan Autonomous Region is to allow Tibetans to have the majority, he adds. Is a resolution in sight? Progress appears slow and has stalled in recent years. Between 2002 and 2010, representatives of the Chinese government and the Dalai Lama held talks on 10 occasions, but made no headway. Talks stalled after the Dalai Lama relinquished political powers over the exiled government in 2011. Beijing says it will not speak with Mr. Sangay’s government in exile. Mr. Sangay though says he’s keen to renew the conversation. “All along, the discussion has been between the envoys of the Dalai Lama and representatives of the Chinese government, and we would like to continue with that practice,” says Mr. Sangay. He is currently drawing inspiration to persevere from Nelson Mandela’s decades-long struggle for freedom for black people in South Africa.